Attractions at and around Bang Tao Beach. 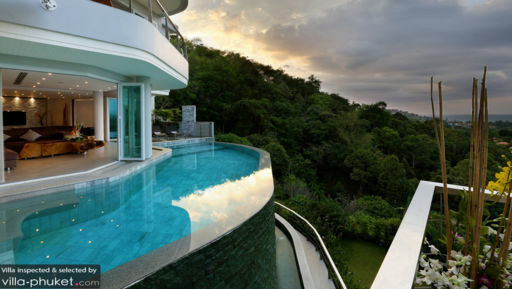 Villa Beyond is a four-level vacation residence that highlights contemporary and plush modern architecture and design. Free-flowing and sunny interiors – with a contrasting white and dark color scheme – are appointed with in-vogue metal and wood furnishings and fixtures. Amenities are expectedly of hotel and resort quality – for the sheer satisfaction and leisure of each and every guest. Laid out on a hill rising from Bang Tao Beach, Villa Beyond, as its name denotes, gives you living comfort that’s beyond the commonplace and which, at the same time, exudes a truly idyllic charm. The villa has seven minimalist bedrooms. Two of these bedrooms are on the ground level. Both have king-sized beds as well as dedicated bathrooms. One of these has a bathtub and a jacuzzi. While the other has a rain shower. Both bedrooms open out to balconies. The master bedroom is on the third level. This bedroom has a king-sized bed and a dedicated, scenic bathroom with a bathtub. The master bedroom opens out to a balcony. Three more bedrooms are also on the third level. All have king-sized beds and dedicated bathrooms with rain showers. However, only two of these bedrooms open out to balconies. One other bedroom is on the fourth level. This bedroom has either a queen-size or double bed and a dedicated bathroom with a rain shower. This bedroom opens out to the villa’s spacious rooftop deck with unobstructed views of both the seascape and the terrain. Right at the edge of the property is the 16-meter infinity pool. Jump into its mesmerizing, crystal-clear waters for some unmindful wading – entranced by the Andaman Sea – or, for some splashy play. From the water, you can stretch out on ergonomic pool beds on covered terraces at both ends of the pool. 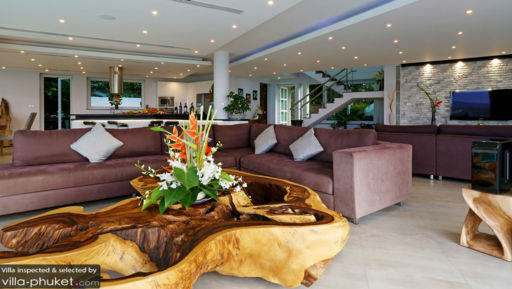 On the villa’s breezy, semi-open second level – following the curve of the infinity pool -- is the semi-circular living area with its large and long sofa. Here, you can all hang out for moments of family or friendly bonding as you gaze out to the distant horizon. Just beside the living area is a TV lounge where you can all catch the shows you’ve been closely following. Or, go on a marathon of your can’t-get-enough-of movies. The villa has two dining areas. The indoor dining area – with its long, wooden table that accommodates 12 – is on one side of the second level. While the alfresco dining area – with its long, wooden table that also seats 12 – is out on the second level terrace under the shade of a triangular sail. At any of these dining areas, you can all relish authentic Thai cuisine – as well as your most requested comfort food – meticulously prepared by the in-house chef at the fully-equipped, ultra-modern kitchen almost at the center of the second level. The kitchen also has a long counter that, provided with stools, can double as a bar. In a separate room beside the TV lounge is the villa’s spa where you can relieve aching muscles with a traditional Thai massage, as well as indulge in a variety of pampering treatments. Assigned to attend to the villa’s daily services is a staff led by a manager and supported by housekeepers. In addition to the chef, a laundry helper and a spa therapist may, upon your request, be called in. However, their services will be charged separately. Breakfast will be included with your booking for a seven-night stay. Car rental is available. 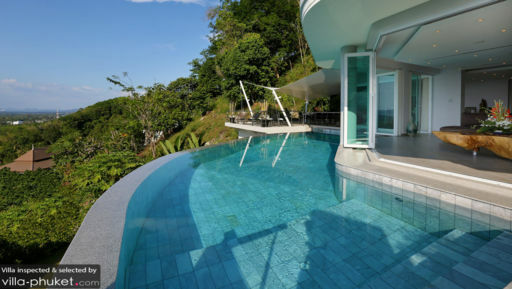 Villa Beyond is located in Bang Tao village. A few minutes by car from the villa is the tree-lined, six-kilometer Bang Tao Beach. From the Phuket International Riding Club, you can go beachcombing on horseback. Then, head to Wat Cherng Talay for some sightseeing. Top-rated dining places in Bang Tao are DeDos, Palm Seaside, CUT Grill And Lounge Phuket, Skye Lake Club and Bampot Kitchen And Bar. On another occasion, you can go wakeboarding at the Anthem Wake Park. Or, play your kind of game at the Phuket Adventure Mini Golf, or at the Laguna Phuket Golf Club.